The differing ethnicities of Riek Machar and Salva Kiir can too easily suggest that the current conflict in South Sudan is all about ‘tribes’. References to “˜tribes’ and “˜tribalism’ form part of the standard repertoire of media reporting and expert analysis aiming to make sense of the resurgent armed violence in South Sudan. In their attempts to explain the recent rupture between South Sudan’s President Salva Kiir and other members of the SPLM leadership, commentators have universally noted that President Kiir belongs to the Dinka ethnic group, whereas Riek Machar is a Nuer. Hannah Bryce, writing for Chatham house – a foreign policy think tank – argues that the current struggle illustrates “the prevalence of political “˜tribalism’ at the highest office”. Thus, in the search for straightforward explanations, “˜tribalism’ is a concept which many commentators readily tap into. However, the key protagonists in South Sudan’s crisis also make use of a distinctly anti-tribalist rhetoric and warnings of ethnic conflict in order to justify their political agendas as well as the use of force. There is no doubt that the dynamics of armed violence in Juba and across South Sudan have taken on an ethnic dimension. The violence has its origins in a stand-off between different factions of the presidential guard. This fault-line quickly spread within the armed forces, as the fighting over key strategic locations in Juba pitched members of the Dinka and Nuer ethnic groups against each other. Reports of targeted killings and perpetrators selecting victims based on their association with specific ethnic groups suggest that distinctions between friends, enemies and respective combat strategies are now widely informed by the framework of etnic belonging. The logic of violence now also informs the dynamics of violence in Jonglei state, where armed youth have targeted civilians specifically based on their ethnic identity (as recent incidents in Akobo and Bor make clear.) The defection of Peter Gadet, identified as an ethnic Nuer, as well as reports of mobilisation in Unity State suggest that South Sudan is on the brink of civil war. Ethnicity provides a lens through which power struggles have been framed throughout most of Southern Sudan’s recent history. Not least have perceptions of exclusion and marginalization from power and resources often been accompanied by ethnic scape-goating. The close linkages between ethnic belonging, armed conflict and survival tightened during the decades of civil war, involving virtually all ethnic groups. This militarization of ethnic identity became particularly stark after the SPLA split in 1991 lead by Riek Machar and Lam Akol. In its aftermath, armed violence between the two SPLA factions became increasingly ethicized, leading to indiscriminate targeting of civilians on both sides. As a result, ethnic identities became more pronounced and exclusive, as well as more relevant for the ordinary South Sudanese, both inside and outside the armed forces. Ethnicity matters in South Sudan not only through the direct or indirect dependency of armed forces and militias on their military and political leaders. It also matters in the provision of protection to the wider population. Given the formal state’s weakness outside of South Sudan’s urban centres, the majority of the rural population continues to understand the provision of protection and security as a communal matter. Since the Comprehensive Peace Agreement (CPA) in 2005, attempts to reform the security sector, to formalise and democratise the security apparatus and to detach the organised forces from political leadership have produced very limited outcomes. This is most visible in poor central control over the armed forces, as demonstrated by Peter Gadet’s defection. It also took Riek Machar only a couple of days (after the first eruption of violence) to claim control over the armed forces in Jonglei state. These centrifugal dynamics have been accompanied by a surge of ethnic violence against the Dinka populations in Bor, albeit it must be noted that many attacks are carried out by forces not formally associated with those who defected from the SPLA. These dynamics suggest a close link between struggles over political leadership, the personalised control over armed forces used in the latter, and ethnic belonging. It is important to note that the use of ethnicity as a frame of reference in the resurgent armed conflict stands in contrast to the much more subtle and complex role of communal belonging in South Sudan’s everyday politics. Since the political transition of 2005, the strengthening of political institutions, as well as the presence of the state at the local levels of government, has created political dynamics in which ethnicity often plays a pivotal role. Attempts to create a decentralized system of governance based on democratic principles have in many places created tensions between different ethnic communities, which perceive access to government services as well as political representation at the local level of government more often than not through an ethnic lens. These tendencies have been exacerbated by recent political reforms which have given a prominent role to “˜traditional’ authorities, which should provide the linkage between local governments and ethnic communities. These reform processes and the quest for strengthening the state in more distant locations have led to increased ethnic fragmentation across the country – a process through which territory became more strongly linked to notions of communal belonging. However, the ethnic categories invoked in struggles over access to state resources hardly match the categories invoked in the current armed violence. Rather than in the broad terms such as Dinka versus Nuer, ethnicity matters most of the time in local politics. While these are often referred to through concepts of “˜clan’ and “˜section’, the meanings of such denominations vary across the country. What these smaller denominations have in common, is that they do not satisfactorily explain the current political crisis. In the national power struggle, none of the prominent protagonists has openly played the “˜ethnic card’. The outbreak of armed violence on the night to Monday 16 December is closely linked to the political stand-off between President Salva Kiir and other leading members of the SPLM, including a number of former members of the government. The frictions between the SPLM leadership had become public through a press conference on 6 December 2013 in which senior members of the SPLM, including the former vice president Riek Machar, the former SPLM secretary Pagan Amum, as well as the widow of the SPLM’s deceased leader John Garang, accused President Kiir of “dictatorial tendencies.” They diagnosed “deep-seated divisions within the SPLM leadership” and demanded that party structures to be reformed in order to make possible “collective leadership.” These requests remained unaccounted for. On 14 December, key members of the SPLM highest executive organ, the Political Bureau, walked out of the National Liberation Council (NLC) meeting, due to what they described as the lack of political dialogue. It is remarkable that the demands made by the political opposition make no mention of ethnicity or “˜tribalism’ in their condemnation of the recent political manoeuvres by the presidency. Instead, they criticized the strengthening of authoritarian tendencies, the lack of collective and democratic decision making and Salva Kiir’s growing influence on party processes. The avoidance of ethnic framing in public discourse coincides with political dynamics in which the major protagonists have actively aimed to promote ethnic accommodation and reconciliation since the CPA. During his tenure as Vice President, Riek Machar strongly advocated the initiation of a national healing and reconciliation process, and apologized to the Dinka Bor community for the Bor massacre pursued by his faction in 1991. Salva Kiir’s strategy of rule has been remarkably similar, aiming at ethnic accommodation at the national level, as visible in the reshuffle of the national cabinet in August 2013. As a native of greater Bahr el Ghazal, the President ensured the strong representation of the Nuer from Upper Nile and other ethnic groups from Equatoria regions through placement of regional representatives in the second and third most prestigious government positions, namely the Vice Presidency and the Speaker of the National Legislative Assembly. While some of the prominent political figures dismissed by the President were ethnic Dinka, such as the former governor of Lakes State Chol Thong Mayay, many of the new cabinet members belong to other ethnic groups. What seems to be most relevant in the choice of new members of the government is political loyalty to the President as well as the balancing between different regions and ethnic groups across the country, in order to achieve inter-ethnic accommodation. In their reaction to the recent incidents, the political leadership in both factions utilised an explicitly universal and anti-tribalist rhetoric. Members of the SPLM leadership loyal to Kiir have recently stressed that the armed violence unleashed in South Sudan is not tribal. More drastically, Kiir recently warned about a repetition of the 1991 Bor massacre, stating that his “government is not and will not allow the incidents of 1991 to repeat themselves again”. Drawing on the memories of past ethnic conflict, Kiir thus justified the military action taken against parts of the SPLA as well as the civilian population through an explicitly anti-tribal language. 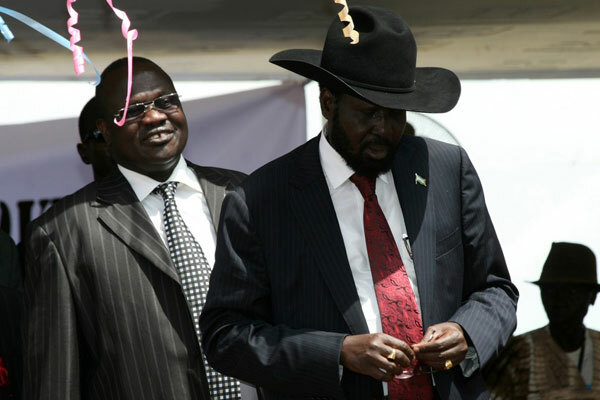 In a comparable vein Riek Machar has accused Salva Kiir of “inciting tribal and ethnic violence”. The threat of ethnic conflict is used by both sides as a strategy to legitimise the crackdown on the alleged perpetrators of violence. In the public space, ethnic categories are not used to differentiate friends and enemies. Rather, by accusing the respective antagonists of inciting or committing ethnic violence, ethnicity informs current strategies of violence in a much more subtle manner. Through the construction of an existential threat identified in the antagonists malevolent “˜tribalism’, both factions aim not only to mobilise for conflict within their own constituencies, but to legitimise the use of force vis-a-vis an international audience, increasingly worried about the possible consequences of ethnic conflict in South Sudan. Andreas Hirblinger is a PhD candidate at Cambridge University. Sara de Simone is a PhD candidate at L’Orientale University of Naples. Having lived and worked in South Sudan for nearly three years including recent months, I agree that there seems to be an undue emphasis on tribalism and ethnicity as part of the explanation on the ongoing conflict in the country. Obviously the lens of ethnicity offers a convenient frame of reference to those who seek to gain understanding of the violence that broke out all of a sudden after what appeared to be a peaceful transition in the wake of the independence in 2011. The reasoning in the international media centering around ethnicity may be providing opportune justifications to the two opposing sides, as the article argues. The article further maintains that the two political leaders have been avoiding references to ethnicity and stating their aims purely in relation to political differences. Nevertheless, it seems there is sufficient evidence that SPLA soldiers belonging to the two tribal groups engaged in targeted killings of soldiers and civilians based on ethnicity. Were they truly divided along the ethnic line? Why did the tensions due to political differences lead to the split of the SPLA forces and targeted killings of civilians along the ethnic line? Why did they spread so quickly to several parts of the country? Is it related to resources and rewards distributed unequally, be it formally or informally, between the ethnic groups within the SPLA and perhaps other spheres in the country? These questions need thorough explanations and attention in order to ensure that peace and stability, which will hopefully be restored through the current international mediation efforts, will be sustained and South Sudan will resume the path towards a fully-fledged nationhood that its people much deserve. It is unfortunate that the mediators of the 2005 agreement did not remember the 1988 New York agreement leading to the independence of Namibia in 1990. There was a two year transitional period during which Namibia was governed directly by the United Nations. This allowed for the development of institutional governance among the indigenous Namibians who had been excluded by the South African rulers. South Sudan had even less preparation for independence than Namibia in terms of education, health, and infrastructure. The two year transition allowed the armed group SWAPO to prepare to become a government in the full sense of the term. The war between the government and southern armed groups (1955-1972 and 1983-2005) has received the most international attention, but a sense of marginalisation has not just been a southern phenomenon. Elements of the Beja in the east, the Fur in Darfur, the Nuba in Kordofan among many others have been drawn into armed conflict with the Sudanese government or government-backed militias. Sudanâ€™s complex armed conflict has been characterised as a civil war of â€˜interlocking civil warsâ€™. Equally, its causes are interwoven: economic, resource-based, ethnic, cultural, religious and international dimensions all play a role, some being more important in some parts of the country than others. All are underpinned politically by the stateâ€™s crisis of legitimacy and its utility as a vehicle for economic exploitation, which drives political elites to compete to control its institutions. Great article. The coverage in the media regarding SS is all over the place, with initial reports from main stream sources taking of the ethnic frame very quickly, as is easy to do from a Western perspective. More recently, I have seen more attempts to throw off that frame because it is perceived as reductionist. I think this article does a good job putting it into perspective. Main stream media does not take the time to explain that many things can contribute to conflict, and the reasons for participation in violence for leaders and followers may be different. Of course, Mr. Machar has worked alongside most tribes in SS as well as working for Mr. Al-Bashir directly! Very nice information on local governance/perspectives.